As Cagayan de Oro City basically is the Rafting Capital of The Philippines and as several rafting companies have trips on the Cagayan River we made a separate section about the white water rafting companies in Cagayan de Oro City. Great White Water Tours already exists since 2006 and offers a great White Water Rafting experience. They offer half day as well as whole day trips. You can find their website on http://www.riverraftingcdo.com. Rafting Adventure Philippines is the oldest White Water Rafting company in Cagayan de Oro City. Except for being the oldest, we can't fully tell what distignuishes them from the other rafting companies in Cagayan de Oro City. You can find their website on http://www.raftingadventurephilippines.com. 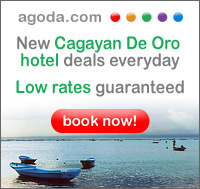 Kagay claims to be Cagayan de Oro's premiere White Water Outfitter and to use State Of The Art Rafts and equipement. They offer rafting trips ranging from the beginners course, which covers class 1-2 rapids, to advance courses, which cover more difficuld class 3-4 rapids. Next to the stated before, Kagay also has safety as one of the major priorities. Very important we think. You can find their website on http://www.cdorafting-map.com. The Red Rafts claim to be most experienced and most professional outfitter for Cagayan River Rafting trips. They aim to provide utmost customer satisfaction and the highest level of professionalism. Nothing to add to that we think. You can find their website on http://www.theredrafts.com.